Veal Rolls, Provencal Style, Thyme for Cooking healthy gourmet recipes. 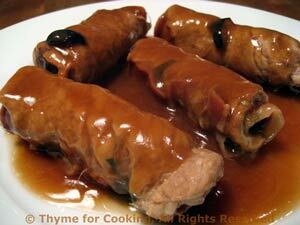 Thinly sliced veal or beef, rolled around a variety of stuffings are found all around the Mediterranean. These, with dry-cured ham and olives, are typical of Provençal. The meat should be between 1/16th and 1/4th inch thick (.4cm). It's best if you can have the butcher slice it. Or buy veal scallops and pound them thinner if needed. Lay the veal slices flat. Pound to make thinner if needed. Lay 1 slice of Prosciutto on top of each slice of veal. Put a layer of spinach leaves on top of the Prosciutto. Divide the olives and place on half of each parcel. They'll spread themselves out as you roll. Starting from the narrow end (where the olives are) roll the parcels up, keeping them as tight as reasonable. Tie securely with kitchen string. Heat oil in small, heavy pot or skillet. Add the veal rolls and brown lightly on all sides. Pour in the wine, reduce heat, cover and simmer for 1 hour. To finish: Dissolve cornstarch in water. Remove veal rolls to a small platter and carefully remove string. Increase heat under sauce. Add cornstarch, stirring until clear and thickened. Spoon over rolls and serve. Note: I didn't have kitchen string and discovered unflavored dental floss works great.